A MoviePlayer manages the playback of a movie from a file or a network stream. 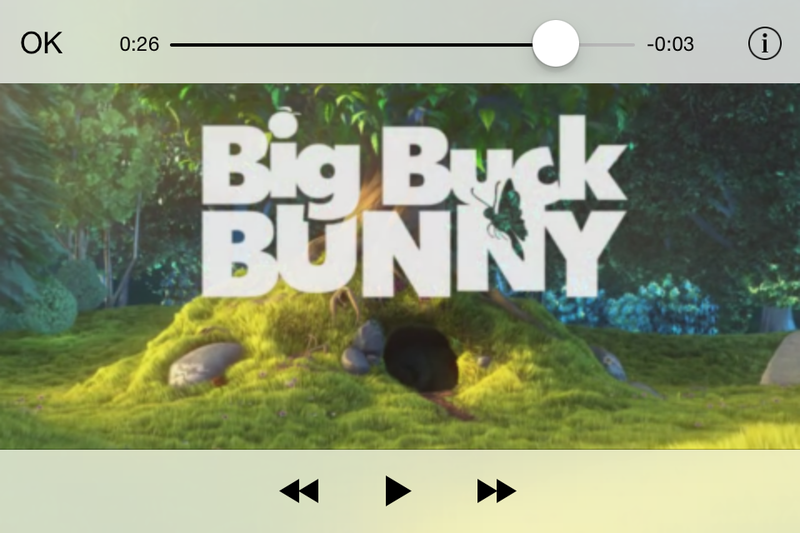 Playback occurs in a view owned by the movie player and takes place either fullscreen or inline. DidEnterFullscreen() Posted when the movie player has entered full-screen mode. DidExitFromFullscreen() Posted when the movie player has exited full-screen mode. DurationAvailable() Posted when the duration of the movie has been determined. MediaTypesAvailable() Posted when the available media types in the movie has been determined. LoadStateDidChange() Posted when the movie player's network buffering state has changed. NowPlayingMovieDidChange() Posted when the currently playing movie has changed. PlaybackDidFinish() Posted when the movie has finished playing. PlaybackStateDidChange() Posted when the movie player's playback state has changed. var contentPath: String The path/URL that points to the local/remote movie file. var movie: Movie Use this property to set the content from a Movie object from the Assets library. var movieSourceType: MovieSourceType The types of media available in the movie. var currentPlaybackTime: Float The current playback time of the now playing item in seconds. var currentPlaybackRate: Float The current playback rate of the now playing item. Default is 1.0 (normal speed). Pausing will set the rate to 0.0. Setting the rate to non-zero implies playing. var allowsAirPlay: Bool Specifies whetever the movie player allows AirPlay movie playback. var fullscreen: Bool A Boolean that indicates whetever the movie player is in full-screen mode. var scalingMode: MovieScalingMode The scaling mode to use when displaying the movie. var controlStyle: MovieControlStyle The style of the playback controls. var initialPlaybackTime: Float The time, specified in seconds within the video timeline, when playback should start. var endPlaybackTime: Float The end time (measured in seconds) for playback of the movie. var shouldAutoplay: Bool A Boolean that indicates whetever a movie should begin playback automatically. var repeatMode: MovieRepeatMode Obtains the most recent time-based metadata provided by the streamed movie. func setFullscreenAnimated(fullscreen: Bool, animated: Bool) Causes the movie player to enter or exit full-screen mode. func play() Plays items from the current queue, resuming paused playback if possible. func pause() Pauses playback if playing. func stop() Ends playback. Calling -play again will start from the beginnning of the queue. func prepareToPlay() Prepares the current queue for playback, interrupting any active (non-mixible) audio sessions. Automatically invoked when play is called if the player is not already prepared.